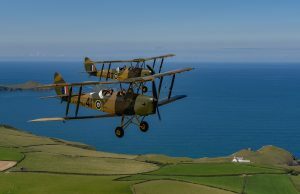 Live the dream and experience the joys of flying in an open cockpit wartime training aircraft over the beautiful picturesque Cornish landscape. 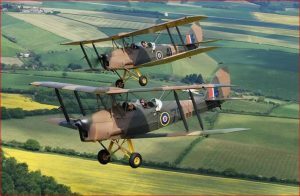 The aircraft you fly in has been lovingly restored to an extremely accurate standard and is flown by a very experienced pilot. On your flight you will wear a sheepskin flying jacket, leather flying helmet and goggles to help transport you back to those halcyon days of real flying. 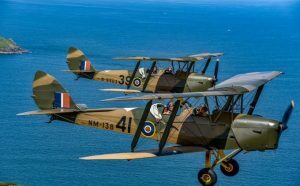 The sensational hour long aviation experience will include a walk round the aircraft with a talk on the WW2 training programme and half-an-hour in the air, when you can actually take the controls. Formation flying is also available so you can fly next to your friend or partner in another similar Tiger Moth. On your return to the airfield you will have the chance to take photos for your memory box and our Diner 31 cafe is at your service. All this for only £250 each, plus you will take away memories for a life time! All are welcome at our events and remember we have the Diner 31 cafe available for food and beverages.